So, I'm making this cardigan for Anne, which I have a strong sense of foreboding will be *very ill fated*, but I'm trying to ignore that right now, and the pattern is for a heart lace. Anne loves hearts, so I was really excited about making this cardigan for her. It's for a newborn, but the designer notes that a knitter could size it up for a toddler by using heavier yarn and larger needles. Done. Well, I'm trying to be a very good girl (*halo*) and use the yarn that I already own in my stash rather than ordering more, but I really wanted the cardigan to be either pink or purple, just given the heart theme. And unfortunately, I didn't have any girly-hued yarn in my stash in the necessary weight AND in the needed quantity. I needed worsted weight pink, but I *did* have some sport weight pink acrylic that fit the bill. I figured I could double the yarn up and it would equal a worsted weight. No problem. I pressed on. Stranding the yarn doubled resulted in lots of annoying yanking from the skein, but I ignored that too, happily awaiting the coming lace pattern. Aforementioned lace pattern arrives. I begin to knit. It quickly becomes clear that (a) the doubled yarn is making the lace far too bulky to be attractive, and (b) the cardigan will be far too large to fit Anne. After consultation with my fabulous knitting group, I decide to rip the cardigan back and knit it with a single strand of the existing sport weight pink acrylic. It appears to be a generously-portioned sport weight, resembling a worsted weight upon close inspection. I re-size my needles down accordingly. The actual ripping back, gentle reader, was not a pretty sight. It resulted in twin piles of angry yarn tangles in my lap that I fought with and swore at. I TOLD it that if it didn't behave I was going to get the scissors, but DID IT LISTEN?! It did not. The scissors came out with a vengeance. Mangled yarn was thrown triumphantly into the trash can. 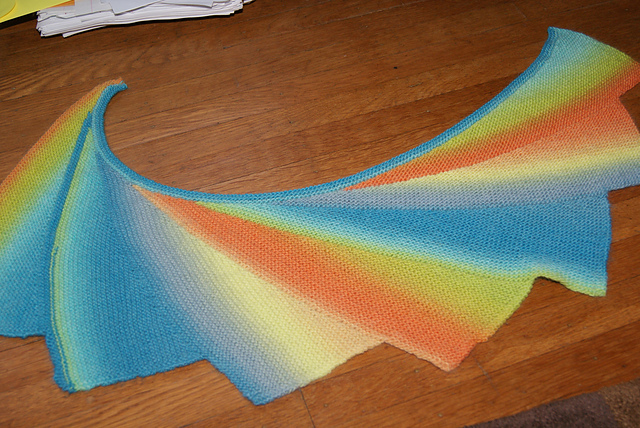 Now I'm worried that I won't have enough yarn to knit the entire sweater, but was that important in that moment? Decidedly not. THAT'LL FIX YA. I re-started. The yoke flew by, and the texture is SO much better. I was a little worried at first that now it was going to be too *small* to fit Anne, but a quick fitting with a squirmy Anne eased my fears. It looks like it will fit. Now onto the lace. Ok, now see? I *wanted* to use stitch markers. (If this sentence isn't an ominous sign in knitting, I don't know what is). But the pattern has one row that is different from the rest, and so any placed stitch markers between section repeats had to be volleyed every time I came to that row and it was making me crazy. I was more comfortable with the pattern by that point and so I took them out. I could see the hearts forming and figured that if I made a mistake, it would become apparent right away and I could fix it. The sleeve separation was a bit dicey, but after quite a bit of research on Ravelry, things went swimmingly. (2) Drinking 2 glasses of Chardonnay. (1) Throw the entire sweater into the garbage, including every last bit of that *freaking* pink yarn. By this point, I'm sick to death of the thing, and I've barely gotten past the sleeve separation. Maybe this is just one of those "bad projects" that has offended the knitting karma and I should just release myself from it's painful oppression. This was at the top of my list last night. (2) Pull the needles out, rip the pattern back several rows, and attempt to re-insert the needles back at a point where the pattern is still correct. This my friends, is what we call, The Crocheters Mistake. Long before I was a knitter, I was a crocheter, and ripping back in crochet is SO, so simple. Rip your little heart out, get back to troublesome spot, fix said spot, crochet on. In knitting? Not so much. Especially with lace where you have all of these deliberated-inserted holes called yarn overs. Picking those back up with your needles? Next to impossible. People that knit a lot of lace insert something called a "lifeline" in their work for a reason. It's a strand that you knit in a a point where you know the patterning is correct. If you make a mistake further up, you can always rip back to the lifeline and pick the stitches up. Did I have a lifeline, you ask? Of course not. Ripping the lace back without one is pretty much project suicide. I considered it anyway. "Sweetie, don't you think maybe you should just put it down for the night?" asks my reasonable husband, who has seen me in his predicament many a time before. "NO!" Because I'm very unreasonable when I get into these predicaments. (3) Un-knit the last 4-5 rows to remove the deformed hearts, and then continue on with the sweater. This isn't a quick solution, but it WILL fix the problem and it means that I can salvage all of the good hearts that were born prior to last night. It'll probably take me 1-2 evenings to undo the bad lace, but I know I'll be happy that I did in the end. ohhh I love those kitchen towels, is that something easy enough for me to learn to crochet on??? If so, link please!? So...how is your Year of Faith going? Come talk to me on Twitter!